I’m not sure what I expected, but I removed the Dog Rocks from the package… and they were plain looking rocks. Maybe I expected them to feel magical or mysterious in some way, but no, just igneous rock from a special site in Australia. I rinsed them and placed them in the filter housing area of my dog water fountain so that my pups wouldn’t be tempted to remove and chew on the rocks. Then it was just a waiting game. My opinion: Do dog rocks work? I conducted this test in August, which isn’t exactly the best month for growing new grass in our area. 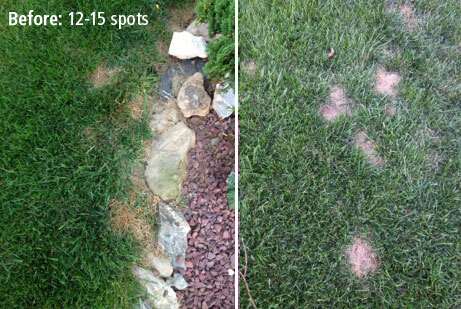 Dog Rocks won’t cure the already existing urine burns, freshly grown grass will eventually fill in the spots. You can speed up the process by tilling the burnt areas and planting new grass seed. I prefer to let the lawn do the hard work. Diet plays a major role in the amount of nitrates in your dog’s urine. I feed a pretty high protein, home cooked diet because my dogs are highly active. Choosing a high quality dog food with appropriate protein levels for your dog is a key component in controlling lawn burn. Dog Rocks need to be replaced every 2 months and one packet of rocks should be in each water bowl that is available to your dogs for the best results. Because I have three dogs and a pretty small yard, my results might not be typical. Pick up a package of dog rocks and give them a try for yourself. They’re all-natural, they won’t harm your pet (so long as they don’t eat the rocks), they’re inexpensive compared to other additives and alternatives, and they might help prevent unsightly urine burn patches on your lawn. 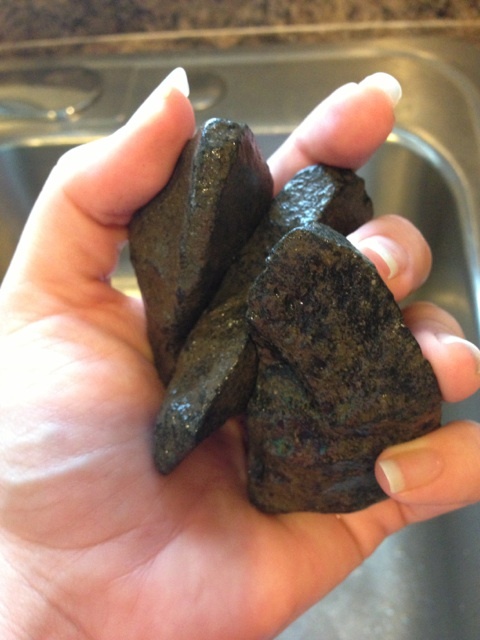 Find Dog Rocks at the lowest price online at thatpetplace.com! 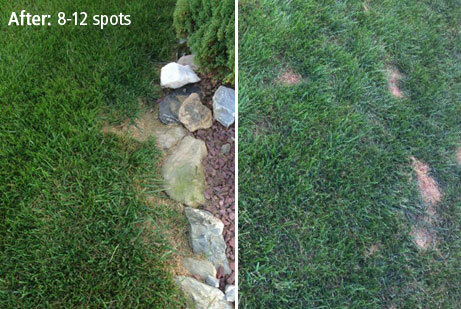 Previous: Preventing Lawn Urine Spots: What are Dog Rocks and How Do They Work? I am about to try the dog rocks in my dogs water bowl, what will happen if she does get one out and chews it? Thanks for commenting. The rocks have a harder texture, so your dog should recognize that it is not a food. Monitor them just in case. Thanks! We put the rocks in a container that we keep water in and then pour the water from the container into the bowl. That way the rocks are not actually in the water dish, but the rocks are in the water that we eventually give to the dog. We have noticed a difference in our yard for sure. I know this is a somewhat old thread, but wondering if anyone’s done the research as to whether giving your dog(s) distilled or filtered water would do the same? I see you mentioned having a filtration part on your dog fountain, so wondering why that wouldn’t have helped already. But maybe the filters do not take out nitrates, just particulates, etc. you’d usually need some sort of binding material to draw the chemicals out, like something that would bond w/ the nitrates – which is what I’m thinking the rock components do….. that’s probably the answer. I’m guessing. but I don’t know for sure! DO NOT GIVE YOUR DOG DISTILLED WATER. Sorry for shouting, but it’s a really, really commonly misunderstood thing that super-pure water is good to drink. It’s bad for humans, it’s bad for dogs. Ultra-pure water can actually leach minerals from your bones and teeth. The pH is also less than ideal. Ordinary filtered water, or distilled and remineralized water is totally fine though. Don’t know if it will help with the grass. I clicked on the link to purchase the dog rocks but it says Item not available. Do you know when they will be? Hi Tara, we are sorry but we no longer carry that item. We apologize for the inconvenience. We use Dog Rocks every summer! I will not be without them…Typically we start giving our dog “rock water” once the snow goes in the spring and continue right through to freeze up in the fall. They have made a huge difference in our lawn…now if I could just get my son to use them for his dog, we would have zero burns. We also keep the rocks in a jug of water in the fridge, and not in the bowl. We are able to purchase them at any pet store. Highly recommended! Well, all I can say is that Ive tried them starting in March and not one grass burn until last week. I am thinking that I have had my 2 months worth of use from them and have just got new rocks. If you use lawn fertilizer, the product does NOT work! This detail is not mentioned on the box and description. Just as it is not mentioned either that must be held 10 hour, stones in 2 liters of water after which you give water to the dog. Lawn fertilizer as a deterrent will not work. It’s just to fertilize the lawn. I feel Lyn’s question has not been answered. As to what would happen if a dog did chew on one of the rocks? Why do you no longer supply this product?